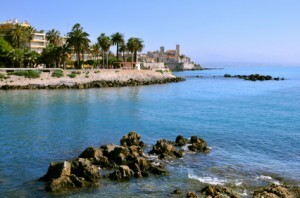 Antibes has a long history going back to the 4th century BC. The strategic importance only became relevant in the 14th century when the French Kings realised the significance of its geographical position. Little remains today of the grand fortifications except the Fort Carre (square fort) and the seafront ramparts. In 1794, Bonapart took charge of the defence of the coast and installed his family in the fort. Robespierre was imprisoned here for some time after his fall from grace within French society. Chateau Grimaldi originally build as a Roman Fort was rebuilt in the 16th century; still preserving it’s Roman Square and Roman Tower, now housing a Musee Picasso. There are many other notable sites worth visiting; the 17th century Cathedral with its magnificent altarpiece, the musee of Archeologique which forms part of the fortifications and contains many important collections for the history of Antibes. Located on the southern point of Cap d’Antibes is the Musee Naval et Napoleonien housed in a fortified round tower, known as the Batterie de Grillon. The well preserved 12th century ramparts now form the seafront boulevard from which a wonderful view can be had of Nice and the mountains behind the city areas. Antibes is the second largest town in the Alpes Maritimes region and offers the residents and tourists alike an immense variation of landscapes, attractions and coastlines to enjoy. Antibes has become a major tourist destination helped by the creation of the Port de Plaisance (yachting harbour). The port is packed with luxury yachts and plays host to the Antibes Yacht Show every April. Many of the full time and part time residence of Antibes live in mix of luxury houses in Antibes from secluded luxury villas in Antibes to penthouse apartments in Antibes town. Much of the homes for sale in Antibes have a Mediterranean feel with some other houses for sale in Antibes following the traditional provencale villa design. There is a large range of property for sale in the areas of Antibes from the multi-million euro villas for sale on Cap d’Antibes to the small city centre apartments for sale in Old Antibes town itself, close to the market with its narrow cobbled streets. Many of the homes in Antibes town are well kept and decorated with flowers climbing the walls or in flower boxes decorating the window sills of the apartments and village houses. The residents of Antibes enjoy a vibrant atmosphere throughout the year with the many festivals and activities both on the water and on land. There are many restaurants, bars and clubs for those who want to experience the night-life Antibes has to offer. Houses in Antibes and its surrounding areas are in great demand and this in turn has increased prices over the past few years. The area is serviced by excellent road, rail and air links. Nice International airport is only a short 20 minute drive from Antibes. There are also many luxury golf courses and family attractions such as Marineland which is said to be the largest marine park in Europe. This tourism development has helped to increase the price of houses for sale in Antibes, however, if buying a house in Antibes for an investment, the rental yields can be quite attractive due to the level of tourism during the summer months and the yachties looking for apartments or other property in Antibes during the winter months. Antibes is perfectly located close to the other glorious towns of Juan les Pins, Cannes, Nice, with easy access to the villages in the hills such as Valbonne, Biot and Mougins.